Here at Pink Lemon Twist we are looking forward to Christmas and New Year’s and we hope you have a Merry Christmas and Happy New Year as well. Blogging will be sporadic through the end of the year, but I’ll catch you up on everything blogworthy. Stay safe, enjoy the holidays and I’ll see you in 2014! I am just a finishing machine lately! Yesterday I finished my Horai wrap and I decided to go ahead and block it to make it bigger. It came out 58 inches long and 19 inches wide and I used almost every inch of all three balls of Shibuiknits Silk Cloud (in Fjord). If I do it again, which is a strong possibility, I’ll buy four balls of yarn because I’d really rather it be a little bit longer. Logan was very excited about the possibility of modeling for the blog this morning. He looks like he’s dreaming of his Christmas gifts in this photo. 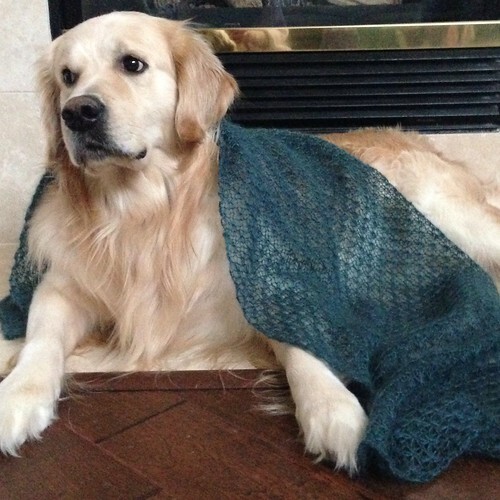 Poor guy hasn’t had a shawl to model in ages. This was a fun project, great for picking up and putting down. Easy to memorize so I didn’t need a chart or markers or anything special to work on it. I did find that using the right needle makes all the difference. Slippery doesn’t work with this yarn and dull points don’t work with this stitch. Bad joins just make me nuts on any project. The Dyakcraft Darn Pretties with the lace point were perfect for this project: not too slippery, nice pointy tips with a long taper, and a great join. Just as a PSA, I’ve talked about the Darn Pretties before on the blog and if you’re thinking of getting in the queue for a set, you should go ahead now. They are going to be raising their prices some in mid-January, but the current prices will apply to all orders placed before then. 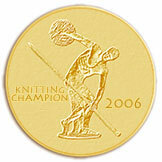 Even with the price increase, I still think they’re very reasonably priced for handmade needles made right here in the US. This shawl is flying! I’ve gotten through the main part and I’ve started the edging. I’ve also gotten through the two lightest colors and I’m almost through the third color. Unfortunately, it’s hard to photograph because I don’t like using long needles, even on shawls, because then I feel like I spend all my time scooting my knitting around the cables. You can see a tiny bit of the sparkle at the top of the picture where the stitch pattern changes. The sparkles are all through the shawl, but the flash only picked up those sparkles for the photo. I’m just about to the point where I’ll start adding beads. I did one other thing yesterday, and that was to sew up some tea wallets. I can’t show them because they’re gifts, but they were super quick and easy to make. I used the measurements in the tutorial I linked above, but I used a tiny bit of elastic instead of a ribbon or fabric strip for the button closure. I’m really happy with how they came out and if you’re looking for a quick gift for a tea drinker, you could whip these out in no time. Can you believe Christmas is one week from today? 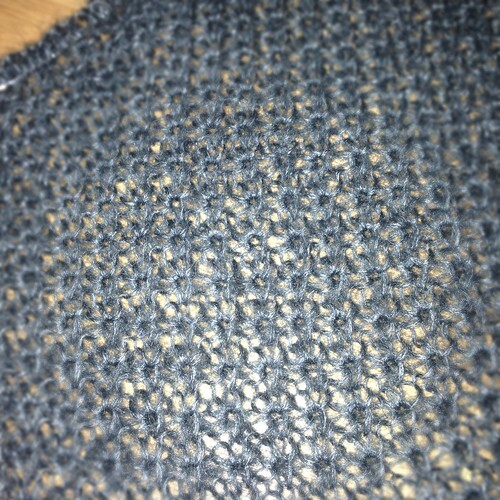 In addition to starting a new project over the weekend, I pulled out my Horai wrap again and got back to work on that. I’m well past 2/3 of the way through with it and I should be able to get it finished up fairly soon. 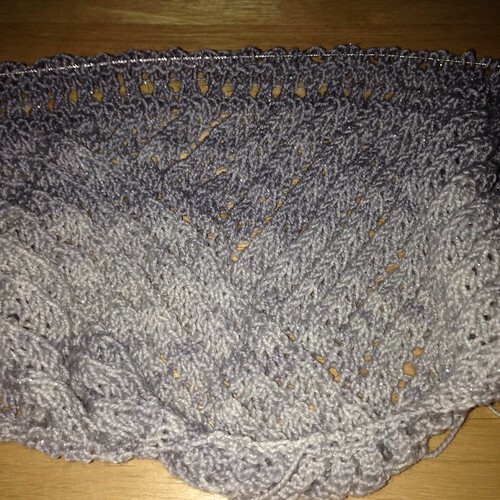 Looking at it, on the needles, it almost looks like it won’t really need blocking. The edges are laying flat, the stitch pattern is pretty open, I’m just not sure whether or not it needs an actual blocking. I’ll make a decision once it’s all finished and if I feel like it needs to be bigger, then I’ll block it. Since we’re at the end of another year, I’m looking ahead and thinking about projects I want to do, techniques I want to learn, and deciding some knitting plans for 2014. I’ll share once I’ve got things sorted in my own mind. What are your knitting plans for 2014? I’m in the SpaceCadet Mini Skein Club (The Ombre and Gradient Mix) and this was October’s Club offering. The base is Lucina which has a tiny bit of sparkle in it. I thought this would be perfect for the Iron Maiden shawl! The black at the right of the photo is actually some black from The Loopy Solids Series that’s left over from another project. 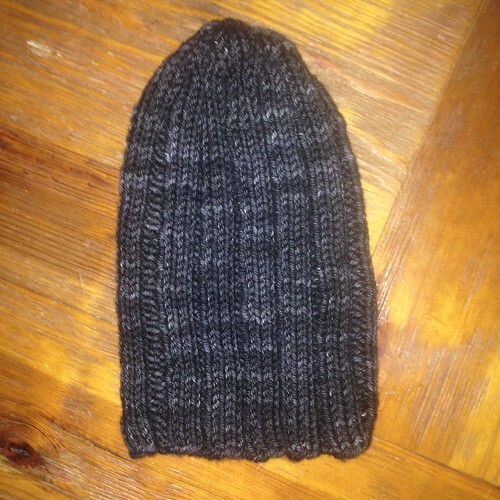 A few people who’ve knit this have run out of yarn, so if I need a bit extra, I’ll go to the solid black at the end. I’m also going to use beads - clear with silver lining because, why not? Also this weekend, Caleb started teaching me to play The Elder Scrolls V: Skyrim. I’ve never been any good at playing video games (there are too many buttons on the controller), but Skyrim has a lot of walking around and talking to people in between the battles, so I’m kind of getting the hang of it. Caleb keeps reminding me to use both joystick thingys at once, and tells me it’s like knitting. I think using two needles at once is much easier than using two joystick thingys at once. Caleb also frowns on trading out my battle helmet for the tiara I found and he doesn’t understand that the helmet is messing up my hair! I’ve finished the second Fightin’ Words mitt, and I’ve washed and blocked them. They’re actually not quite finished drying at the moment. I used The Loopy Ewe Solids Series in Smoke and White (Caleb picked the colors), and I knit them on US 1’s (2.25mm). I’m very happy with how they came out and I hope Caleb enjoys them. I’m going to be doing more stranded color work soon, so it was good to get a little practice. 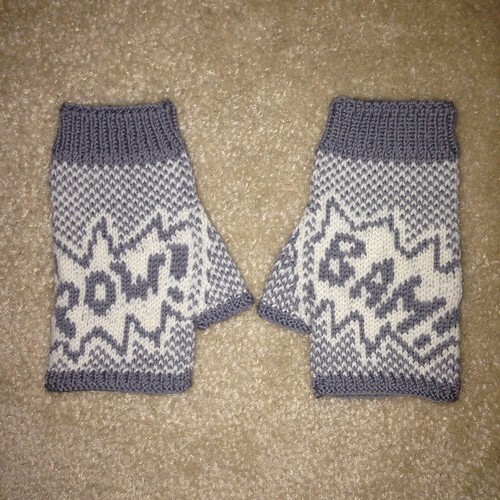 I won’t be knitting a second pair for Mickael as I could tell when he saw Caleb’s that he wouldn’t wear them. That’s part of the reason I did Caleb’s pair first - I’d rather know that Mickael isn’t interested in them before I get them knitted up. I hope you all have a wonderful weekend! I’m hoping the backyard melts! I’ve finished the first Fightin’ Words mitt, BAM! 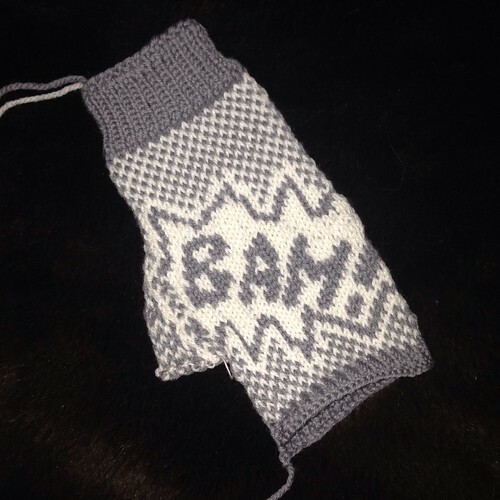 This one worked up very quickly and I’ve actually finished the lower ribbing of the second mitt (POW!) and will start the stranded portion of the knitting today. Little Caleb (who’s almost as tall as I am now) will enjoy these. The sun is out this morning and I think the temperature is going to start slowly going up as the week goes on. That would be nice as we’re all sick of freezing every time we open the door to let Logan out. Logan loves the cold though and has enjoyed playing in the sleet that piled up in the backyard. I not only finished knitting my Ravello, I got all the ends woven in too! We had a big storm come through Thursday night and the roads are still icy enough to have some of the schools shut down this morning. 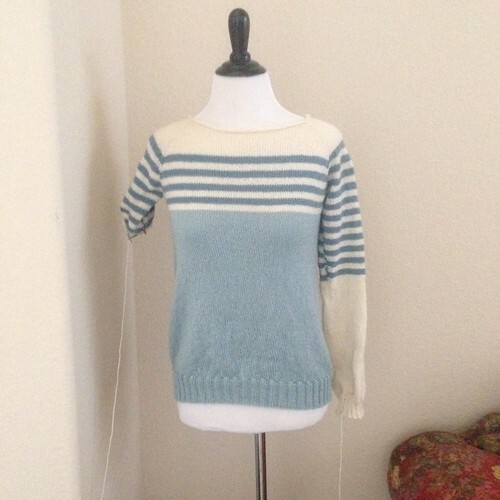 It was perfect knitting weather and I curled up with hot tea, Netflix, and Max and got this sweater finished. I still need to give it a bath and block it so the stitches lie down perfectly, but I’m really happy with how it turned out. I’ll have to count ball bands so I know how many yards I used of each color, but I’ll sort that out when I update my Ravelry page for this project. Sleeves that is. I lost some momentum on this sweater when I was finishing up Mickael’s socks and hat, but now I’m back to it. We’re supposed to get icy storms here this afternoon, so if that pans out, I plan on curling up in the sofa with this sweater and a cup of tea. I think that will be a perfect afternoon! First though, I have to run a few errands. I hope you’re warm and safe wherever you are! Caleb’s green hat was knit using this pattern and Madelinetosh Vintage in Terrarium (which tends to resemble camo pretty well). 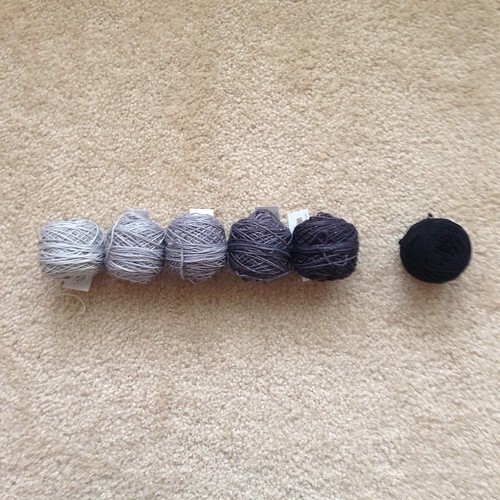 I couldn’t find any Vintage in any of the Madelinetosh blacks, but I found the 80/10/10 base in Onyx on Madelinetosh’s website. Once I got the yarn, it only took a couple hours of knitting and his hat was finished. Knitting a black hat is easier than black socks. 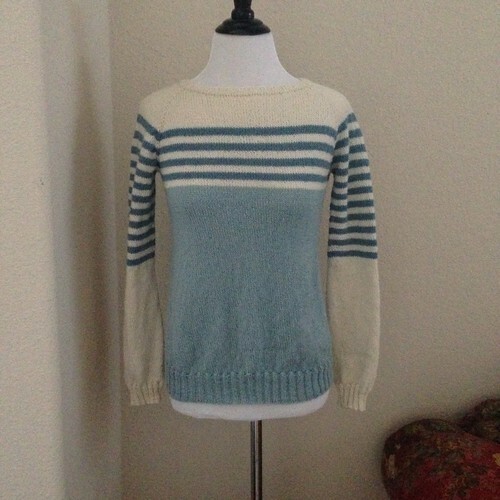 It would be nice if Mickael wanted hand knits in colors other than black though. Just so you know, right now the hat is pulled in on itself because of the ribbing. I don’t block hats because they need to be a bit snug. Once Mickael starts wearing it, it will size to his head.